Never let it be said that Daily Billboard isn't an equal opportunity blog, whether it be showcasing the latest ripped male underwear model, or celebrating the female form in all its glory. Today's Battle of the billboards sees competing youthful fashion houses Armani Exchange and Calvin Klein (AX vs. CK), getting ready for Summer and preparing to show more skin. Which billboard do you prefer, the more beach lifestyle from Armani Exchange featuring Camila Queiroz, or the simple studio shot creative featuring Madison Headrick for Calvin Klein? 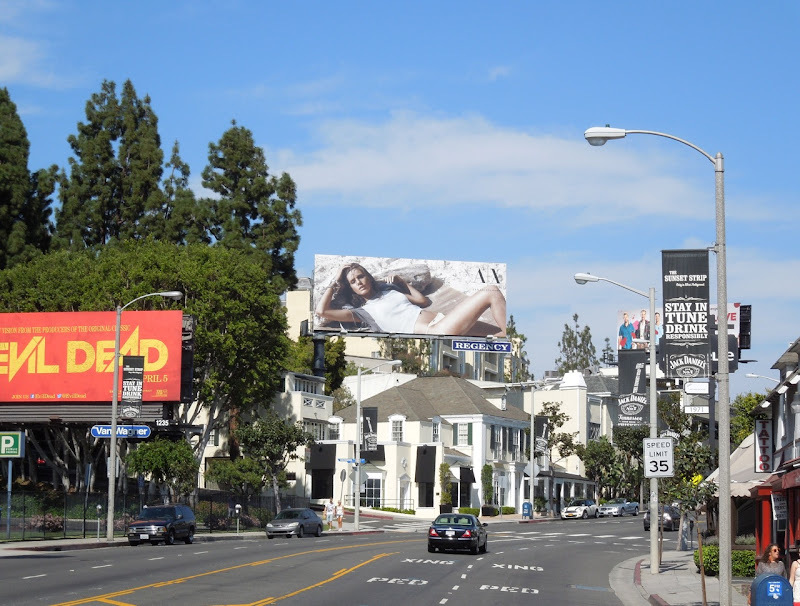 Fortunately for the fashion brands, these bikini babes snapped on April 3, 2013 can be found at opposite ends of L.A.'s Sunset Strip, the Armani Exchange ad at the start of eastbound Sunset Plaza and the Calvin Klein creative westbound, beside the Chateau Marmont Hotel. If you like these beautiful models, be sure to check out these Eva Mendes Calvin Klein underwear billboards, this giant European Wax Center bikini billboard and this Nikki Beach Las Vegas billboard, to name but a few gorgeous female models to be found here at Daily Billboard.